Every year on the day before Patriot’s Day, Captain William Smith rouses the Lincoln Minutemen to alert them that the British Regulars are marching on Concord. This is the night in history when Paul Revere was captured on the outskirts of Lincoln and several brave men took over his mission: to prepare the local resistance for battle. Curly, before the ride tonight, enjoying the attentions of her fan club. 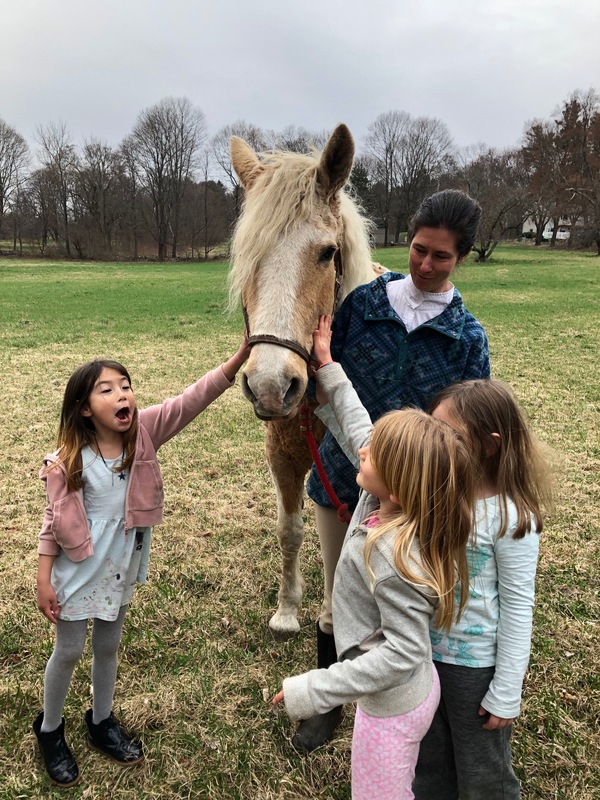 For these little girls, it’s all about the horse. Every year on this auspicious day, residents and visitors gather by the Lincoln library to relive local history. And, of course, to see the horse. While I was the rider many moons ago, when I would ride my Trakhener, Kronefurst down the hill with the message of impending conflict, I turned over my cape and tricorn hat to Lindsay and Curly many years ago. It’s a role Curly relishes. Although she can be an eating machine, when she stood at the top of the hill tonight, she didn’t want to grace; she waited eagerly for the call that would start her mission. Down the hill she came, not blinking an eye at the umbrellas and not giving even the slightest hint of a spook when three little girls ran out to join the charge. She was in her element!